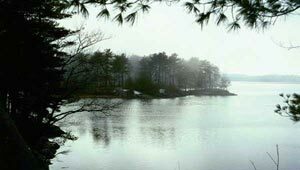 Located only 1.5 miles from downtown Portsmouth, Sagamore Creek Headlands is a scenic stretch of waterfront land in heavily settled coastal New Hampshire. The ten-acre peninsula juts into the biologically diverse Sagamore Creek estuary, a popular destination for kayakers and birdwatchers. The property lies near existing city-owned open space and the state's Urban Forestry Center and features a waterfront walking trail through mature forests, significant tidal marsh, and rock outcroppings offering outstanding views of the creek. Both the city of Portsmouth and the Seacoast Land Trust identified the site as a priority for conservation, aware that it was also a prime target for residential development. In 2003, TPL helped the city purchase the property for permanent use as open space. Thanks to the leadership of Senator Judd Gregg, nearly $2 million from the new federal Coastal and Estuarine Land Conservation Program was allocated towards the purchase, with the remaining funds provided by the city of Portsmouth.